Apollo Nida has found love again and reportedly engaged to a beautiful and successful woman named Sherien Almufti. Although the “Real Housewives of Atlanta” star is basically still in the beginning of his eight-year stint in prison, the handsome personal trainer has a new fiancé that he’s announced to the world shortly after it was announced that his divorce with Phaedra Parks was finalized. Around a week ago Apollo posted on his Instagram account that he was engaged along with the caption “You see that smile? That’s how she makes me feel all over! #MyQueen #NidaFitness #TheNidaTeam #FreeApollo #Goodmorning”. Can fans expect a nice prison wedding for Apollo and his fiancee? After social media blogs went wild trying to figure out who the woman was, Sherien Almufti stepped into the spotlight to claim her man by commenting on his account that it was her and that’s when others took notice that the Arabian beauty has been posting photos of Apollo on her account. Sherien is a very successful realtor, real estate investor and property manager who has an eight-year-old daughter and an ex-husband. She is reportedly going to be on “Real Housewives of Atlanta” alongside her hubby to be Apollo Nida. It is speculated that she and Phaedra might have words because Sherien and Apollo have been seeing each other since the summer of 2013. This is believed because she shared a photo of Apollo with the hashtag summer ’13 in the caption, even though Apollo was still married to Phaedra then. The drama doesn’t stop there; the Apollo Nida’s new lady has an ex-husband who isn’t too fond of the way things have been going with his daughter that he shares with Sherien. Apparently Sherien has been taking their daughter with her to see Apollo at the Fort Dix prison where he is serving time for fraud and identity theft. In addition to that she also took her daughter out of school to shoot her rumored scenes for the reality show. Not to mention that she apparently moved cross country to be closer to visit Apollo in prison. None of these things sit well with her ex-husband and he’s been doing interviews slandering her name and spilling the tea ever since. Apollo clapped back by calling out his fiancé’s ex-husband for not paying child support for his daughter. The situation is getting messier by the minute and will probably play out on camera later in the season for the show. 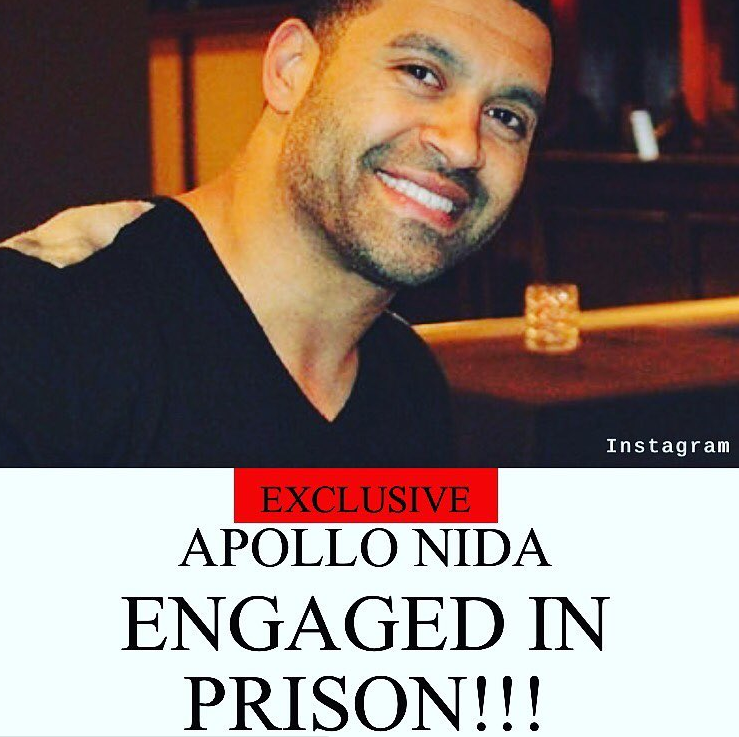 What do you think of Apollo Nida marrying so soon? Do you think Sherien Almufti is wrong for exposing her daughter to a prison environment or does she need to bond with Apollo because he will be her step-father after all? Let us know in the comment section below.